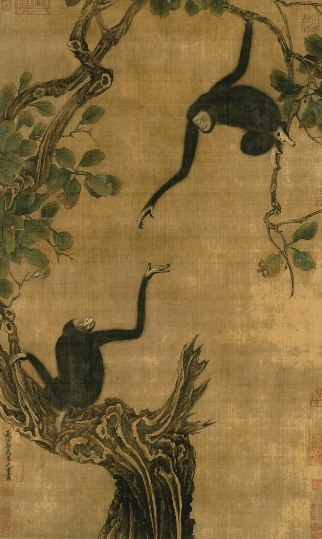 Close to 1,000 years have passed since the artist captured these two apes on silk. 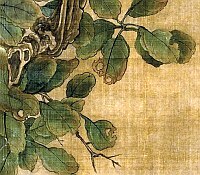 Yi Yuanji (1000-1064) was a Chinese painter during the Song Dynasty who created the specialization of gibbon painting to stand out from the other artists who were painting more traditional Chinese subjects like birds and flowers. In these two detailed, close-ups of the painting, I monkeyed (sorry couldn’t resist) with the colors of the images to make the fine detail work of Yuanji be more noticeable. 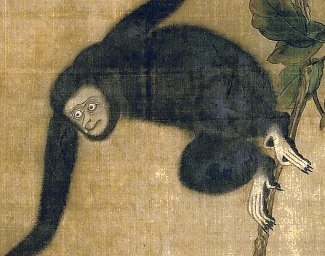 The face on the highest monkey reminds me of Ebeneezer Scrooge and I can’t hope but wonder if the artist did use a person’s face rather than that of a monkey for this painting. The detail work of the leaves appears to be quite well done and I think made even more interesting with several damaged leaves. Yi Yuanji is also known by the name Yüan-chi under the Wade-Giles romanization system of the Mandarin Chinese language. To learn more about the artist and see additional examples of his paintings, please visit our biography of Yi Yuanji.